The Family Service at 9 a.m. is now a permanent part of our Sunday service schedule. This service will last about 45 minutes most Sundays (9-9:45 a.m. approximately). It features a short children’s talk. There are opportunities for youth, children, and families to serve in greeting, offering, and reading lessons. A brief address is designed to be accessible to everyone from middle school level and up. Holy Communion is on the 3rd Sunday of month. 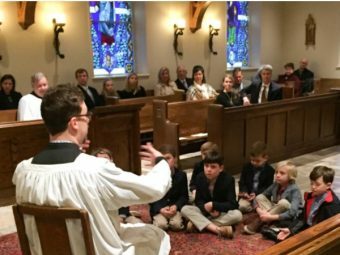 Nursery care is available beginning at 8:45 a.m. until 12:15 p.m.
Children are encouraged to remain for the entire service. Fidget binders are available in the Chapel to keep busy hands occupied! Refreshments follow the service in Cranmer Hall, 1st floor, Fellowship Room. About Sunday School We have options for the whole family. When service ends around 9:45 a.m., those attending are encouraged to enjoy refreshments and to get to know each other better in the Fellowship Hall on the 1st floor of Cranmer Hall. Children are invited to take part in Children’s Ministry directed by Sarah Ross on the 2nd floor of Cranmer Hall. Middle and Upper School youth are invited to take part in the Youth Ministry led by David Svihel on the 3rd floor of Cranmer Hall. Adults are encouraged to take part in one of our four Sunday School offerings. parishioners who will moderate these informal discussions.